Take a Look at Our Previous Virtual Tours! Our 360 and 3D Virtual Tours are proving to be a huge success with excellent results. Explore our previous work and see for yourself how this ground-breaking technology works …. Our most recent work was Le Vogue’s Google 360 Virtual Tour. 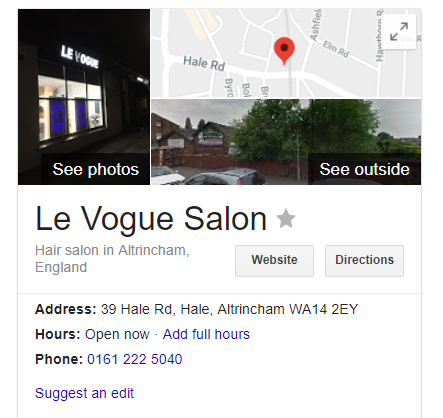 Head over to Le Vogue’s 360 Virtual Tour to see how they appear on Google. Google are the dominant search engine, with 1.17 billion people use Google to search for information. Most of your target market will search for a venue using Google. 360 Virtual Tours are a Google accredited product, so users will be able to engage with your Virtual Tour using Google. Making your tour accessible through Google will increase consumer’s engagement on their search, which will push them to enquire and visit your venue in person! Let us capture every intricate detail of your venue, giving your visitors a realistic idea of what to expect when they visit. Different Gravy Digital are experts in producing virtual reality tours! Let us help you bring your venue to life. Get in touch for a free, no obligation consultation for more information! Marie Harwood is a Digital Marketing Assistant at Different Gravy Digital, Hale, Cheshire. Different Gravy Digital are a full service Digital Marketing Agency operating in the Hospitality & Leisure, Financial Services, Legal & Property sectors. Products and services range from; 3D & 360° Tours, Website Design & Build, Social Media, Video Production, Search Engine Optimisation (SEO), Content Creation, Email Marketing, Online Feedback / Review Systems and Paid Advertising (Google, Bing and Social Media). What’s The Best Image File Format?